These dim, moving wisps means that you would need all the light-gathering ability you can afford. This in turn implies a camera with a big sensor, and putting it behind a lens with a large aperture. You’ll also need exposures of typically 5 – 30 seconds each, and use high ISO. Since you’ll be using longer exposures, you must put your camera on a stable platform. Lastly, you’ll need to shoot raw and post-process the images for best results. You can only properly see the Lights when it is dark, and only at high latitudes. You should avoid being near large cities or any other sources of (light) pollution. This means that it will most likely be isolated and cold, so pack warmly. Camera batteries perform badly in cold temperatures, so be sure to bring a fully charged spare. The aurorae are not perfectly predictable. They come and go, dependent on the flux of charged particles from the sun. If there are clouds, you might have to wait night after night until it clears up. I’d suggest planning your trip carefully to maximize you success. We are currently in a local maximum of the 11-year solar cycle, yet there are no guarantees. It also looks like the current maximum is not especially powerful, yet you also don’t want to wait 11 years until the next one. 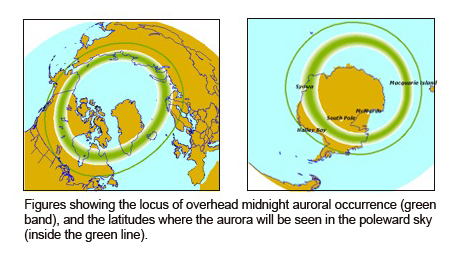 The aurorae usually occur in a doughnut shaped ring around the North and South pole. Below is a map of where this ring lies, followed by a map of typical cloudiness for the various locations. As you can see the clouds are out to spoil your photo trip. 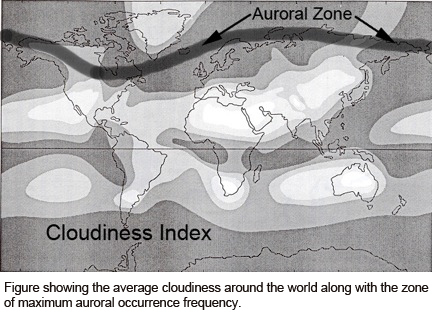 The best places that combine cloud-free viewing with strong auroral activity seem to be Canada (e.g. Fairbanks) and Eastern Siberia. For us folk in Europe the best place is indeed North-Eastern Norway. 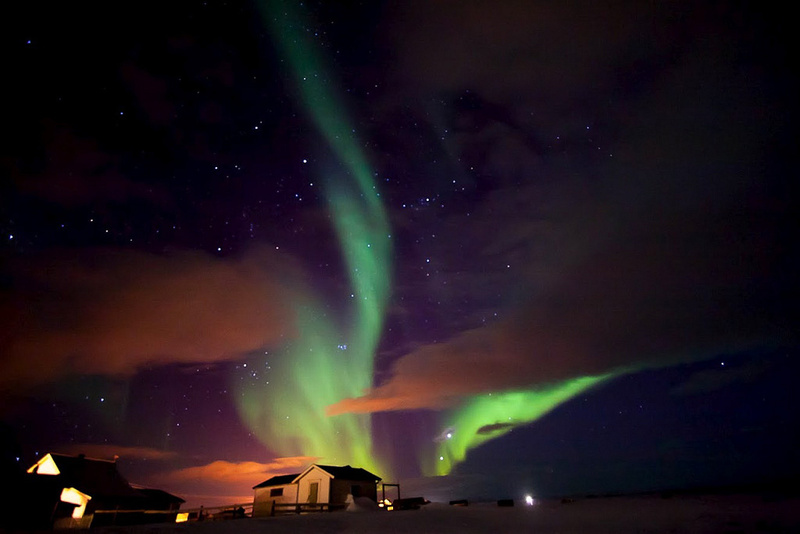 There are websites that track auroral activity, and can help you to plan your trip on a week or two’s notice. If you’re spending all the money and time to travel to the cold North to photograph The Lights, you should seriously consider buying, or renting, a full-frame camera for this job. This is because a full-frame sensor has more than twice the light-collecting area of a cheaper APS-C type sensor – you’ll be grateful for all those extra photons you capture. A Full-frame camera has more than twice the light collecting area of its APS-C counterpart. The Nikon D610 and Canon 6D are excellent for this task, as they are relatively affordable, yet give you all the full frame goodness. If you want to be adventurous you can also consider the brand-new mirror-less Sony A7R. If price is no barrier you should consider the Nikon D4 or Canon 1Dx, as these two come with indestructible reliability and ruggedness, large batteries to resist the cold, and are designed for ultimate low-light performance. Not only do you want the largest camera sensor you can afford, but you will also need a fast lens (one with a large maximum aperture, i.e. that lets in a lot of light), while giving you enough of a wide angle view to create captivating compositions containing both the amazing night sky as well as some of the foreground / context. The wide angle will not only give you more interesting compositions, but will also lessen the apparent motion blur in your image, e.g. of trees in the wind, or of the aurora itself. The less you’re zoomed in, the smaller the relative effect of any motion in your image. This means you’ll be looking at a lens with less than 20mm (equivalent*) focal length. For these lenses, an F2.8 aperture rating is often the largest aperture you can get, and also what you should aim for. You don’t absolutely need the sharpest lens there is as the aurorae themselves will be motion-blurred and wispy anyway, but a sharp lens will make the stars, and any foreground or landscape you wish to include, look better. Auto-focus is irrelevant as you can manually set your lens to infinity. If you’re a Nikon FX shooter like me, you should see if you can get hold (rent it if you must) the brilliant Nikkor 14-24mm F2.8 lens. Canon full-frame shooters have the Canon EF 16-35mm F2.8 II lens that also comes highly regarded. This is what e.g. a Nikon D610 + 14-24mm F2.8 can do. Photo by Mike Taylor. If you do decide to use a APS-C type camera* (Nikon DX or Canon EF-S) you get second prize for absolute performance, but first prize for value-for-money by combining your cheaper camera body with the very affordable yet excellent Tokina 11-16mm F2.8. (I recommend this model over the newer version II as it is optically as least as good, and significantly cheaper). Sony users choosing the Sony A7R face more of a hassle as there are very few dedicated lenses available for its brand new full-frame E mount. With an Alpha-to-E-mount adapter, for example, you can use the Alpha-mount Sony 16-35mm F2.8. For even more light-capturing ability, at the loss of of the wide angle, you can consider a super-fast wide-angle f/1.4 prime, such as the Nikkor AF-S 24mm f/1.4 G ED or Canon EF 24mm f/1.4 USM L II. *Important note: 20mm is considered ultra-wide angle on full frame (FX) cameras, but not on APS-C (DX) cameras due to the crop factor. If you e.g. have a Nikon D3200, Canon Digital Rebel, or Micro Four Thirds camera, you should use a lens with a shorter focal length, e.g. the Tokina 11-16mm F2.8. You’ll be working with little light, and due to the aurora’s movement you can’t stretch your exposure beyond a few tens of seconds. So you will need to use high ISO to boost the camera sensor’s sensitivity. The photo at the top of this post was taken at ISO 1000. With modern full-frame cameras you can get away with higher, but probably you wouldn’t want to push the camera to more than ISO 3,200 (or ISO 1,600 for an APS-C sensor). 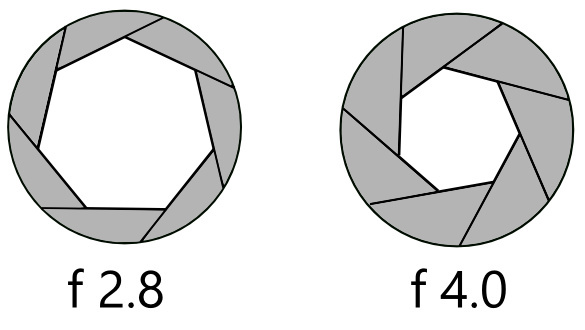 Choose a large aperture (e.g. F2.8) to capture as much light as possible. With the lenses I mentioned in this post you will already get great sharpness at F2.8, and since everything in your scene is distant, you don’t need to worry about depth of field. Use an exposure time between 5 and 30 seconds, depending on your composition and how fast the aurorae are moving. Feel free to experiment, though. Set white balance manually to daylight (the little sun icon). Your camera won’t be able to figure out what kind of light you’re shooting in, so just tell it. “Daylight” gives a good natural starting point that ought to be close to the way it looks to the human eye, and it is best to be consistent. Experiment from there — you can always change if afterwards, as you will be shooting in raw as I explain in the next paragraph. You must shoot RAW (e.g. Nikon NEF, Canon CR2, Sony ARW file format). I say must because anything else is a waste of your camera’s potential. Your images will need aggressive noise reduction, white balance and colour adjustments to make the most of them. Raw files are a much, much (much!) better starting point than JPEGs for such manipulation. Unlike regular photos, post-processing will strongly show the limitations of JPEG. Just shoot raw, always. You will need a tripod, and as winter conditions can be harsh, it should be a decent one. I’d recommend a Manfrotto 294 carbon tripod. It is compact and light, won’t freeze your hands like an aluminium one will, is built solidly and with good ergonomics, and just beautiful to look at. The supplied ball head does the job, although you could consider something more elaborate. Also, it will be useful to have a cable release, remote trigger, or to use the self timer so as to prevent camera shake. If your camera has a mirror lock-up feature, you should consider using it to reduce motion blurring. 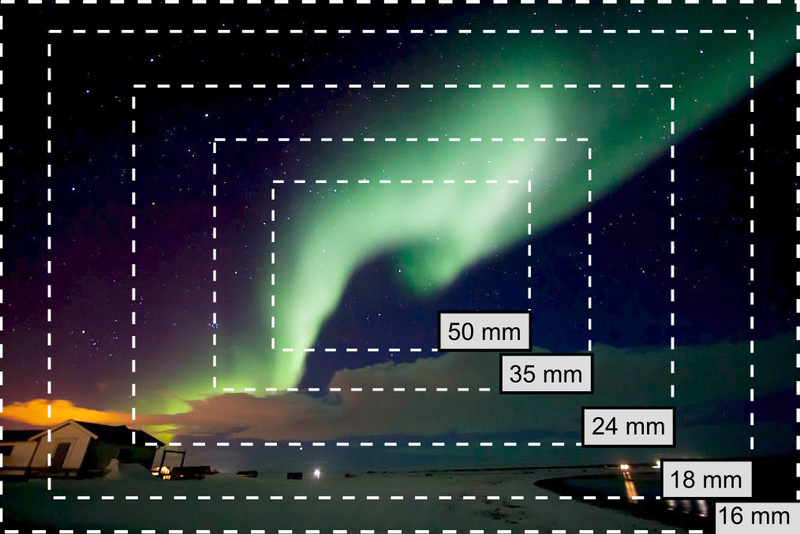 You will most probably end up using high ISO settings to get bright aurora images, and this means that you will have quite a lot of grain / noise in your images. You’ll also need to boost your images somewhat to bring out the most vibrance. See this example below, also from Bart’s trip to Varanger. I dislike Adobe as a company, and I value the alternative of open source software when given a choice. That said, Adobe Lightroom is currently an industry standard for professional editing, and my personal favourite for its quality and ease. Lightroom offers excellent noise reduction as well an integrated work-flow, and I can highly recommend it. You can find a great series of introductory tutorials on using Lightroom on photographylife. When all is said and done, a lot more is said than done. You should hold me to account on this. You can have the best camera in the world, but if you’re not there you won’t get the photograph. You should buy good gear, but don’t spend so much that it prevents you from seeing the sights / lights. And then go see them! Aaah, I too wish to one day go and see the lights.